It’s no secret that this past year has been the year of the Influencer. An estimated 21.7 million posts for various brands were influencer sponsored on various social media platforms in 2017, and that number is expected to increase in the next 2 years. Influencer sponsored posts gained such massive popularity recently because their posts felt genuine, easier to relate to for the average consumer than a post made by a top-tier celebrity, and they were successful at garnering views and followings. Let’s face it, you’re more likely to trust your close friend’s opinion on the newest Starbucks latte than a Kardashian, and influencers and marketing teams capitalized on that consumer characteristic. These statements are in the past tense because it is becoming apparent that the rate of success and impact that influencer posts are having on the general consumer population is reaching a plateau. Have you ever noticed that when you scroll through your Instagram feed, every influencer post blends into the next? The Pinterest perfect colors, pristinely placed (although sometimes ill-matched) product with a generic, uninspired caption and 2,000 likes is starting to feel stale, and you end up just scrolling right past it and not even looking into the product anymore. This is a problem. The initial goal of having influencer sponsored posts was to increase impact and engagement. You can find more and more influencer accounts with 50k followers garnering as little as 700 likes and comments on a sponsored post. So, how can influencers and marketing teams combat this and keep gaining an engaged community? At IMAGEMOTION, we believe that there should be an emphasis on a 360-degree strategy. One that combines influencers and their impact, media strategy, and quality content production. That way, no part of the moving pieces is over-saturated, leading to an increase in the quality of reach and therefore its engagement. Overall, it is crucial to remember that engagement on a post is way more valuable than its reach. There is little true value in a sponsored post if 40,000 people see it and only 100 people end up taking action as a result. Both influencers and brands’ marketing teams should be vigilant about taking a good look at themselves in the mirror, so to speak; looking into who they are as an individual or brand, what they value, and how they want to promote those values in a genuine way on social media platforms. This means taking extra care in pairing up for focused, mutually beneficial collaborations as a next step, with the quality of content at the forefront of those collaborations. Collaborations are made with the ultimate goal of driving sales. Every brand wants to turn an audience into happy customers, and have the responsibility of sifting through the over-saturated pool of influencers to help turn their vision into a reality. 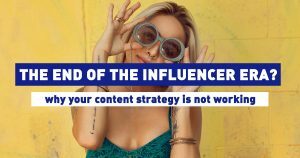 Investing the time to curate the best selection of influencers, and fostering a long-term relationship with them will guarantee the creation of high-quality content that is aligned with both side’s values, and will help tell a story that engages the target online audience on future posts. If the relationship between influencers and brands is real, their target audience will feel that and, instead of scrolling past the content on their Instagram feed, will stop and react accordingly by interacting and engaging.